Arctic News: Looking the climate abyss in the eye! Looking the climate abyss in the eye! Growth of CO₂ in the atmosphere is accelerating. 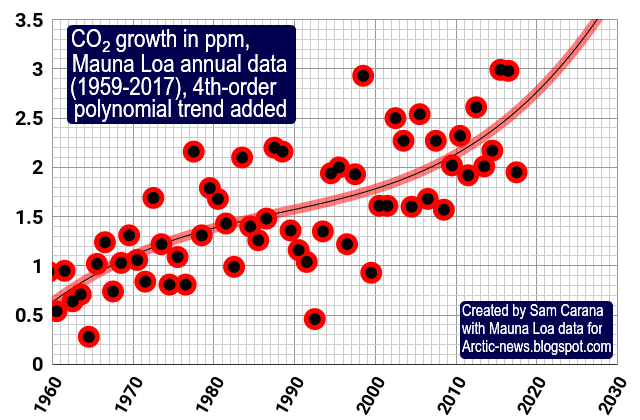 The image shows the growth rate in parts per million (ppm), based on annual Mauna Loa data (1959-2017), with a 4th-order polynomial trend added. While no data are yet available for the year 2018, the trend on above image points at 2.65 ppm. The image below shows the level for the most recent week, which is 2.53 ppm above the corresponding week a year ago. Carl Rasmussen calculates that the de-seasonalised growth rate has now (at the middle of 2018) reached ±2.3 ppm/y. Carl adds: "the rate of growth is itself growing, [it is] the highest growth rate ever seen in modern times. This is not just a 'business as usual' scenario, it is worse than that, we're actually moving backward, becoming more and more unsustainable with every year. This shows unequivocally that the efforts undertaken so-far to limit green house gases such as carbon dioxide are woefully inadequate." Even more alarming is the growth in methane. Peak methane levels were as high as 3.37 ppm on August 31, 2018, an ominous warning of the threat of destabilization of methane hydrates at the seafloor of the Arctic Ocean. 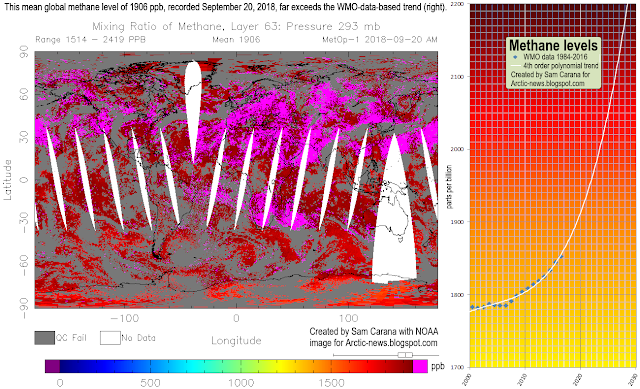 Mean global methane levels were as high as 1.91 ppm on the morning of September 20, 2018, at 293 millibar. This is a level unprecedented in human history and it far exceeds the WMO-data-based trend (added on the right of above image). Temperatures look set for a steep rise within years, as we now are fully in the danger zone. Meanwhile, the IPCC seeks to downplay the amount of global warming that has already occurred and that looks set to eventuate over the next decade or so. The image on the right shows the full extent of the climate abyss that we’re facing. Have a look at the Extinction page for more details on the full extent of the threat. How many people and species will survive the coming temperature rise? We don’t know. The best we can do is to support climate action, i.e. action that starts immediately, and that is transformative, comprehensive and effective, as described in the Climate Plan. Have a look at the lines of action depicted in the image below. • Can we weather the Danger Zone?